I’ve been continuing my audio book experiment, with mixed success. People were right to caution me to sample a lot, because a narrator you don’t like can really turn you off even a book you’re otherwise quite interested in. Finding books that I can follow easily enough by ear is also not as straightforward as I expected: the book has to be engaging enough to keep me attending but not so intricate that the slightest wavering of my attention is fatal. 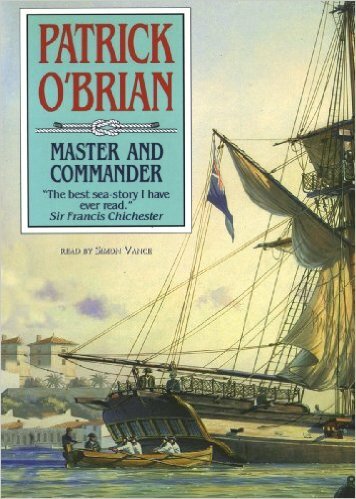 One book I thought was going to be a big success was Patrick O’Brian’s Master and Commander. I read it years ago and enjoyed it; I have always expected that eventually I would make my way through the whole series. When I found that all the books were available from the library as audio books narrated by the highly-recommended Simon Vance, I was excited! I spent several hours listening happily enough to Master and Commander, and Vance is indeed excellent. I became increasingly certain, though, that when I read the book in paper, I had skimmed (not to put to fine a point on it!) over a lot of the details about riggings and fo’castles and 18-pounders — which is not a small proportion of the book. Much as I like Jack Aubrey and his reserved sidekick Stephen Maturin, I just wasn’t up for 13 hours of that. 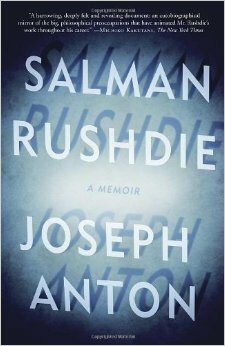 I am currently listening to Salman Rushdie’s Joseph Anton, and it has been going very well: I was gripped immediately by his account of the initial effects of the Ayatollah Khomeini’s fatwa, and then drawn into the backstory of Rushdie’s early life and development as a writer. I’ve now made it back to The Satanic Verses and a few months into his life in hiding, and I’m keen to keep going. I am daunted, however, to realize that the unabridged audio book is twenty-six hours! With only a couple of hours a week in which I’m likely to sit and listen, it might be January or February 2016 before I make it to the end — and my library only allows so many renewals. In the 5 or 6 six hours I’ve already listened, too, I could probably have read one or two other books. By comparison, for instance, I read all of my book club’s latest pick, Kingsley Amis’s Ending Up, in just a couple of hours over yesterday and today. So what is the opportunity cost of the 20 or so hours remaining on Joseph Anton? A compromise that occurred to me is to switch to the hard copy, and I might yet make that move. I would like to get to the end one way or another: I’m genuinely interested in what seems to me a story of continuing relevance to our struggle between religious tolerance and expressive freedom. I wonder, though, if in this case I would miss hearing the book: I’m not sure how much Sam Daston’s expressive narration accounts for how much I like it. It seems to me the kind of book that might strike a reader quite differently depending on the tone they think it has. At times Daston conveys a lot of anger and frustration, and also some arrogance, but at other times he sounds profoundly grateful, sincerely puzzled, or engagingly passionate, especially about his (that is, Rushdie’s) ideas and hopes for his novels. What could seem like special pleading, self-pity, or rationalization sounds in Daston’s voice like someone trying hard to tell his own side of a difficult story in which (as he has experienced it) he has had to live with a lot of misrepresentation, not to mention outright hatred. There are certainly some aspects of the book I’m not entirely comfortable with, but some of them come with the territory in a memoir: his reports about his wife Marianne Wiggins’s behavior during their time together in hiding, for instance, or the frequent name-dropping about literary celebrities (but if your friends are Margaret Drabble and Ian McEwan, should you not be able to mention them?). Anyway, while in this case listening to the book might be making it more appealing, or might have brought out the best in it (which is what any writer should hope for from a narrator), at the same time, in other ways, it has rather hobbled me as a reader. This might mean, in turn, that I would be better off listening to books I won’t end up wanting to write about, especially if they take up so much time that a lot of other books end up unread. Next Article Amis and Spenser and Scandal, Oh My! 26 hours, boy. I see that the text is 656 pages – wow, I had no idea – which would likely be 12 to 13 hours of reading for me. That’s a big difference. Of course, I don’t listen to audiobooks because they would cut into music, so the issue is moot, but if I did, well, I would have to keep the time in mind. Thinking about two of your recent postings, I wonder: did anyone ever make an audiobook of a graphic novel? Would it be like Mayor LaGuardia reading the comics on the radio?